Definition at line 598 of file iterative_linear_solver.h. Definition at line 604 of file iterative_linear_solver.h. Definition at line 609 of file iterative_linear_solver.h. Definition at line 615 of file iterative_linear_solver.h. Definition at line 751 of file iterative_linear_solver.h. References oomph::GS< MATRIX >::Matrix_can_be_deleted, and oomph::GS< MATRIX >::Matrix_pt. Referenced by oomph::GS< MATRIX >::disable_resolve(), oomph::GS< CRDoubleMatrix >::disable_resolve(), oomph::GS< CRDoubleMatrix >::solve(), oomph::GS< MATRIX >::~GS(), and oomph::GS< CRDoubleMatrix >::~GS(). Definition at line 627 of file iterative_linear_solver.h. References oomph::GS< MATRIX >::clean_up_memory(), and oomph::LinearSolver::disable_resolve(). Definition at line 738 of file iterative_linear_solver.h. Definition at line 621 of file iterative_linear_solver.h. Returns the time taken to set up the preconditioner. Definition at line 728 of file iterative_linear_solver.h. Definition at line 706 of file iterative_linear_solver.h. References oomph::GS< MATRIX >::Matrix_pt, oomph::GS< MATRIX >::Resolving, and oomph::GS< MATRIX >::solve(). Set up the smoother for the matrix specified by the pointer. Definition at line 634 of file iterative_linear_solver.h. The smoother_solve function performs fixed number of iterations on the system A*result=rhs. The number of (smoothing) iterations is the same as the max. number of iterations in the underlying IterativeLinearSolver class. Definition at line 651 of file iterative_linear_solver.h. References oomph::GS< MATRIX >::Matrix_pt, oomph::GS< MATRIX >::solve_helper(), and oomph::Smoother::Use_as_smoother. Definition at line 1133 of file iterative_linear_solver.cc. References oomph::Problem::communicator_pt(), oomph::Problem::get_jacobian(), oomph::Problem::ndof(), oomph::oomph_info, and oomph::TimingHelpers::timer(). Referenced by oomph::GS< MATRIX >::resolve(), and oomph::GS< CRDoubleMatrix >::resolve(). Definition at line 667 of file iterative_linear_solver.h. 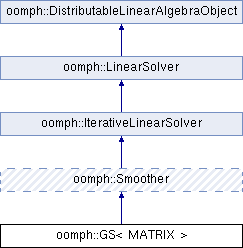 References oomph::DistributableLinearAlgebraObject::build_distribution(), oomph::DistributableLinearAlgebraObject::distribution_pt(), oomph::LinearSolver::Enable_resolve, oomph::GS< MATRIX >::Matrix_can_be_deleted, oomph::GS< MATRIX >::Matrix_pt, oomph::GS< MATRIX >::Resolving, oomph::GS< MATRIX >::solve_helper(), and oomph::Smoother::Use_as_smoother. Linear-algebra-type solver: Takes pointer to a matrix and rhs vector and returns the solution of the linear system Call the broken base-class version. If you want this, please implement it. Definition at line 696 of file iterative_linear_solver.h. Definition at line 1194 of file iterative_linear_solver.cc. References oomph::DoubleVector::build(), i, oomph::BlackBoxFDNewtonSolver::Max_iter, oomph::DoubleVector::norm(), oomph::DistributableLinearAlgebraObject::nrow(), oomph::oomph_info, oomph::DoubleMatrixBase::residual(), oomph::Global_string_for_annotation::string(), and oomph::TimingHelpers::timer(). Referenced by oomph::GS< MATRIX >::smoother_solve(), oomph::GS< CRDoubleMatrix >::smoother_solve(), oomph::GS< MATRIX >::solve(), and oomph::GS< CRDoubleMatrix >::solve(). Definition at line 769 of file iterative_linear_solver.h. Referenced by oomph::GS< MATRIX >::iterations(), oomph::GS< CRDoubleMatrix >::iterations(), and oomph::GS< CRDoubleMatrix >::solve_helper(). Definition at line 777 of file iterative_linear_solver.h. Referenced by oomph::GS< MATRIX >::clean_up_memory(), oomph::GS< CRDoubleMatrix >::clean_up_memory(), oomph::GS< CRDoubleMatrix >::setup_helper(), oomph::GS< MATRIX >::smoother_setup(), oomph::GS< CRDoubleMatrix >::smoother_setup(), oomph::GS< MATRIX >::solve(), and oomph::GS< CRDoubleMatrix >::solve(). System matrix pointer in the format specified by the template argument. Definition at line 766 of file iterative_linear_solver.h. Referenced by oomph::GS< MATRIX >::clean_up_memory(), oomph::GS< CRDoubleMatrix >::clean_up_memory(), oomph::GS< MATRIX >::resolve(), oomph::GS< CRDoubleMatrix >::resolve(), oomph::GS< CRDoubleMatrix >::setup_helper(), oomph::GS< MATRIX >::smoother_setup(), oomph::GS< MATRIX >::smoother_solve(), oomph::GS< CRDoubleMatrix >::smoother_solve(), oomph::GS< MATRIX >::solve(), and oomph::GS< CRDoubleMatrix >::solve(). Definition at line 773 of file iterative_linear_solver.h. Referenced by oomph::GS< MATRIX >::resolve(), oomph::GS< CRDoubleMatrix >::resolve(), oomph::GS< MATRIX >::solve(), and oomph::GS< CRDoubleMatrix >::solve().